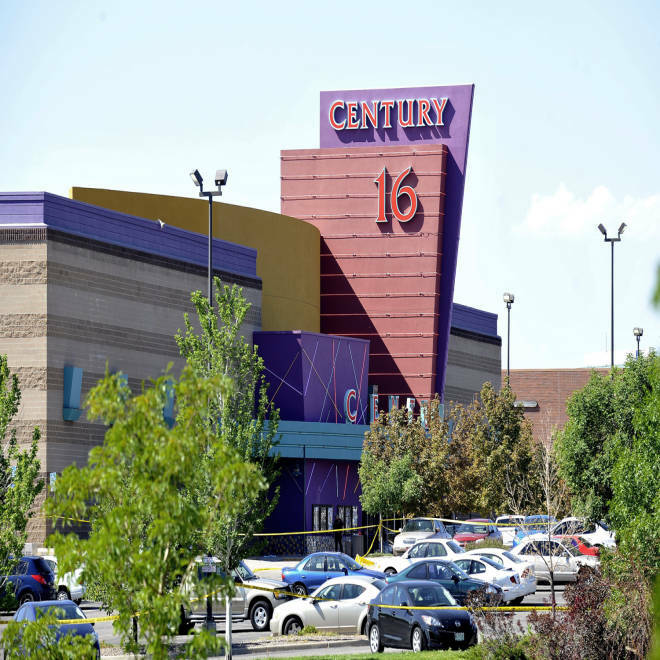 The Century 16 Theater in Aurora, Colo., could reopen by early next year. Three injured victims of July's Aurora, Colo., movie theater massacre that left 12 dead and 58 wounded are suing the company that owns the theater for not taking enough safety measures, Denver's NBC-affiliate KUSA reported Friday. Two lawsuits that have been filed in federal court allege that Cinemark USA, the owner of the Century 16 Theater in Aurora, could have had more security equipment and security personnel to prevent the gunman from entering the theater through a rear exit door and committing the mass shooting, KUSA reported. The complaints were filed on behalf of Brandon Axelrod, Joshua Nowlan and Denise Traynom, according to KUSA. All three were injured in the July 20 shooting, which occurred at the midnight premiere of "The Dark Knight Rises." James Holmes has been charged in the case. "Any person who wished to make a surreptitious and unauthorized entry into the theater could easily determine that the lack of security personnel and lack of any alarm on the door at the right, front by the screen of Auditorium would allow them to leave the theater, and re-enter without fear of being discovered, interfered with, monitored or stopped," the lawsuits allege, according to KUSA. KUSA also reported Friday that the movie theater will reopen by the beginning of 2013. The future of the Century 16 theater had been in question since the shootings. The city of Aurora conducted a survey on Facebook to ask what should be done with the building, and a city spokesperson said the majority supported re-opening the theater, KUSA reported. Aurora Mayor Steve Hogan wrote a letter to Cinemark USA on Sept. 12, according to KUSA. "While no one will ever forget that day, it is now time to look forward and plan for the future," Hogan wrote. "We believe that we are hearing, and indeed have heard for some time, a collective wish and desire for the theatre to re-open." On Sept. 20, Cinemark USA president and CEO Tim Warner wrote back to Hogan, KUSA reported. "We look forward to working with you about the best way to reopen the theater," Warner wrote. "We hope the theater will be ready by the beginning of the New Year." On Thursday, Aurora took down a temporary memorial near the theater, according to KUSA. Also on Friday, The Denver Post reportedthat Kenneth Feinberg, who mediated the Sept 11. victim's compensation fund, will oversee the distribution of a nearly $5 million fund for the Aurora victims. The office of Colorado Gov. John Hickenlooper is reportedly in discussions with Feinberg, according to the Post. On Aug. 28, the families of the Aurora victims held an emotionally charged news conference, where they said they had been shut out of the decision-making process for the fund.